Le Cirque Is Finally ClosingAfter a tumultuous few years, the storied French restaurant will shutter after New Year’s Eve. 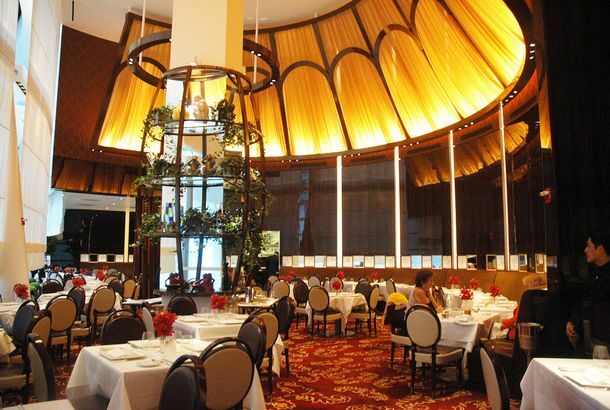 Is This the End of Le Cirque?The Maccioni family’s iconic Manhattan restaurant is in very serious trouble. First Look at Barano in WilliamsburgAlbert Di Meglio returns to his Southern Italian roots. Kristen Wiig at Locanda VerdeThis week’s Celebrity Settings. The Other Critics: Pete Wells Docks A Voce Madison and BLT Fish; Ryan SuttonThis week’s roundup. Broken Up: The Death of New York’s Romantic RestaurantsFor years, owners and customers alike have conspired to kill the mood. Sirio Maccioni Named Beard Foundation Lifetime Achievement Award Honoree forThe man who popularized crème brûlée is being recognized. Le Cirque Opens ‘Signature’ Outpost in Mumbai, Two More Planned forThe 39-year-old restaurant heads east. Harry Styles Goes to Therapy With a Kardashian; the Carrie Bradshaws Meet atPlus: A-Rod at Pacha, and more, in this week’s roundup. Happy Birthday, SirioThe maestro turns 81. Mauro Maccioni Has a Pretty Good Handle on the Family BusinessEven restaurant empires get personal. Le Cirque Chef Olivier Reginensi Now Cooking at Maison KayserGet ready for chilled pea soup with mint, and of course, spring. Platt: One Star for Sirio Ristorante and Strip House MidtownThe legendary Le Cirque restaurateur opens a Tuscan-minded hotel outlet, while the Euro-themed steakhouse’s empire expands. Le Cirque Investigating ‘Peak’ Menu Pricing, Early Bird DiscountsPrime time will cost you. Le Cirque Will Replace Olivier ReginensiThe Times can still get a chef fired! Can Le Cirque Survive Its One-Star Review?What’s one star worth, anyhow? Pete Wells Files a Double Dose of Disappointment; Ryan Sutton Loves AteraPlus: ‘The New Yorker’ hits Reynard, and more, all in our weekly critical roundup. Le Cirque Becomes a Traveling CircusPopping up in a city near you! Sirio Maccioni Shows Off His New ChefHow long will it last? Hopson Left Le Cirque for The BrewsterBig change for the chef. Chef Departures at Le Cirque and Ai FioriTwo great chefs move forward. Maya Angelou Pens New Cookbook; 15% of U.S. Used Food Stamps in AugustThe great U.S. author publishes her second recipe collection called Great Food, All Day Long. Le Cirque’s Craig Hopson to Host L.E.S. Pop-upExpect dishes like lobster tortelli with foie gras sabayon at the Hotel on Rivington’s penthouse. Ben & Jerry’s Gives Away Free Cones; Crumbs Gives Away Free CupcakesPlus: Der Kommissar opens, and more, in our daily roundup of neighborhood news. Le Cirque Loses Executive Pastry Chef, But Is Doing ‘Quite Well’If you’re thinking of applying for the job, rest assured you won’t be hopping aboard a sinking ship. India Will Get a Dosa Le CirqueItaly meets France meets Delhi? Le Cirque Has (Literally) Gone to the DogsMarco Maccioni lets his mutt dine at the bar, but what about yours? Le Cirque at the CrossroadsRumblings have it that Le Cirque may move or close by the end of the year, but the Maccionis aren’t ready to let go. Cruise Girls Cause a Stir at Balthazar; Beyoncé and Jay-Z Celebrate atPlus: Penn Badgley gets his money’s worth at Mercadito Cantina, Larry Flint shows up big at Elaine’s, and more in our weekly recap of celebrity dining. Le Cirque Alum Michael Wurster Will Be Chef at Tavern 2.0The chef has also served under Alain Ducasse and Thomas Keller. Those Darn Kids Take Over Le CirqueSirio Maccioni is displeased with the younger generation’s choices in footwear and beverages. Steve Cuozzo Will Hold His Breath Until White Tablecloths Come BackThe ‘Post’ critic rants against the “casualization” of fine-dining restaurants. Le Cirque Dabbles in D.J.’s and Doormen, But Don’t Call It aThe fabled restaurant will now be throwing weekly parties with (gasp!) a promoter?